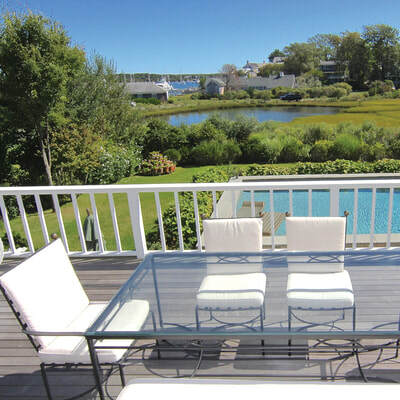 Overlooking a small pond and the harbor beyond, this meticulously maintained five-bedroom South Water Street home welcomes guests while maintaining private areas for the owners. The current owner/architect recently completed a carefully thought out renovation of the light-suffused interiors while respecting its past. Built in 1899 in the Victorian style with later additions, the property is seen in an old photo as quite small but with many gingerbread details similar to Oak Bluffs homes of the period. The house retains its elegant curved entryway staircase, plaster walls and moldings, and wide pine flooring in the original portion. There is oak flooring and tile in the renovated portion and all bathrooms have marble tile with Waterworks nickel finish fittings. The period entrance door is surrounded by sidelights and topped by a wooden fanlight. To the right a passageway leads to a two-car garage. The entryway leads to a library with shelving on two sides and steps down to the lower level. From here, the harbor is on view through the expansive living room picture windows. 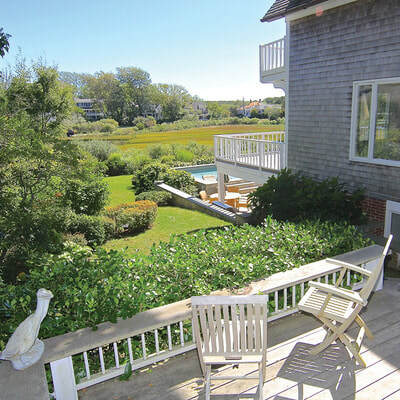 This room with a wood burning fireplace has French doors leading to a 14’ x 24’ sunny observation deck that overlooks the gunite pool, garden, and a small pond and allows an 180-degree views from the harbor and Chappaquiddick to the water tower. 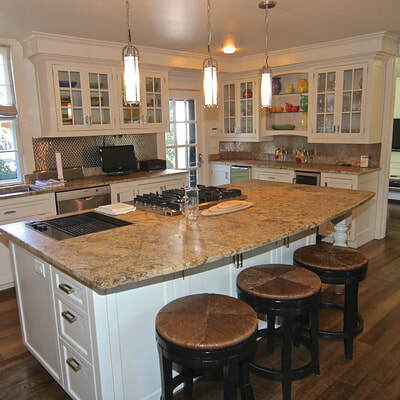 To the left is the dining room with built-in cabinetry, a recessed wet bar and three-sided windows in the Queen Anne style turret. Beyond is the state-of-the-art chef’s kitchen that easily connect to the home’s other social areas. 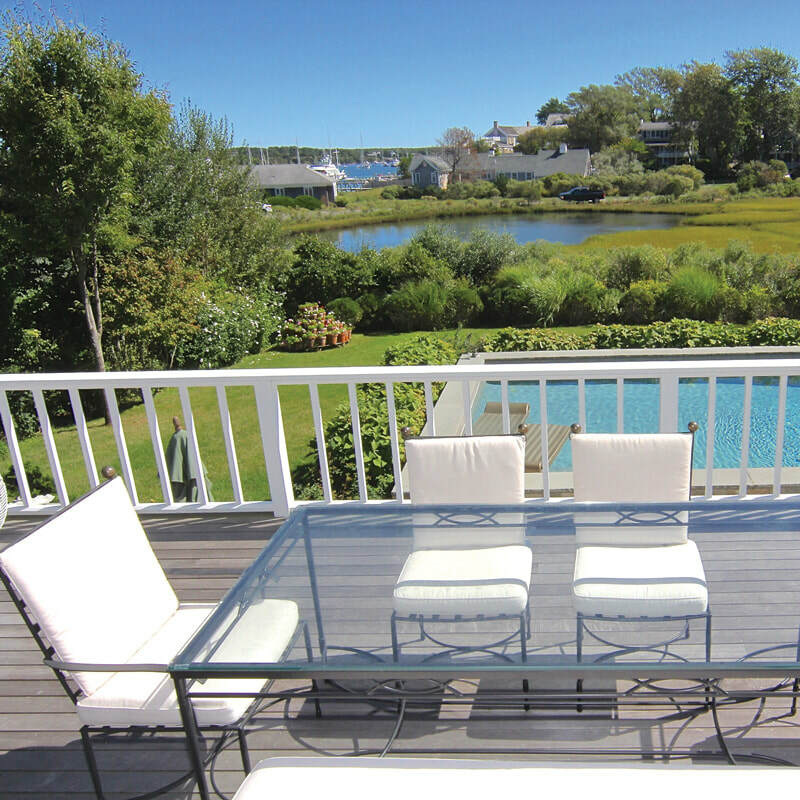 It offers ample glass-front storage and its own door to South Water Street. A granite island contains a Jenn-Air grill and four-burner Viking stove and provides seating for four. 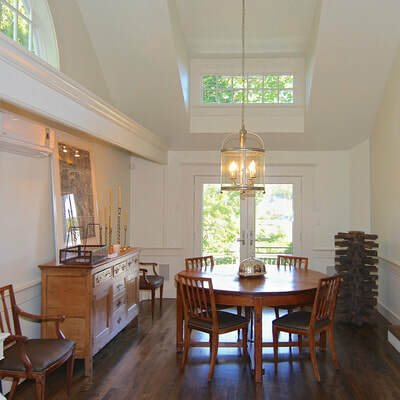 A step down leads to a vaulted ceiling family room with a dining area that overlooks its own deck. Clerestory windows on three sides let natural light pour in. The far side of the kitchen leads to a small hallway that goes back to the entryway with an Italian style half bath to one side. 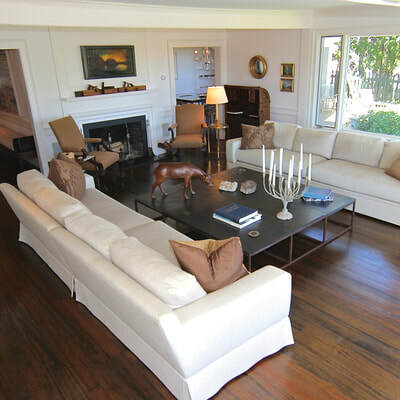 To the right of the library is the former sunken living room, now converted to a luxurious private master suite with two-story windows overlooking the harbor. The space includes a sunny exercise room with a mirrored wall and ballet barre, a bathroom with skylight, a separate vanity area, a bedroom with two walls of mirrored cabinetry, a window seat with storage underneath and a quiet alcove with a wood burning fireplace. A spacious dressing room with an exterior door to the garden leads to a laundry room with a high capacity LG washer and dryer. 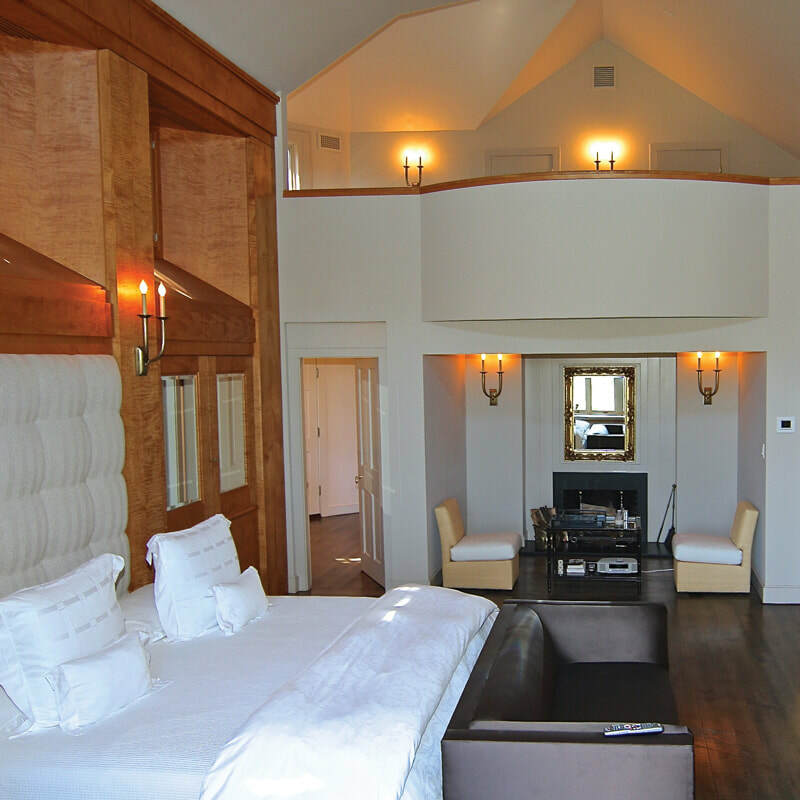 A balcony overlooking the bedroom contains an office with a three-sided built-in desk and two walk-in closets. “The master bedroom and home office with its own exterior entrance is an entirely separate area from the second level group of bedrooms so it’s a hideaway from guests and grandchildren!” the owner says. The first bedroom on the second floor has original wide pine floors and a walk-in closet. There is a hall bathroom that serves this bedroom only since the three other bedrooms on this level have en suite baths. One bedroom shares the three-sided window configuration with the dining room as part of the turret. 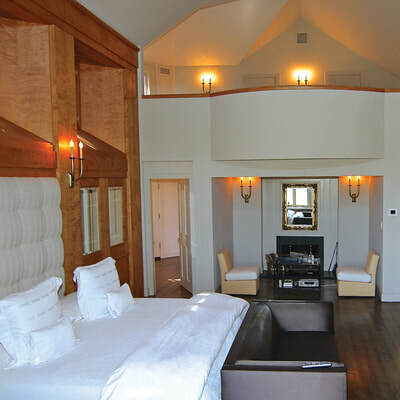 The second floor master suite has a vaulted ceiling, dressing room, bathroom with double shower and a bay window with seating that provides the most panoramic view from the property. A narrow deck provides the perfect spot for morning coffee. There is a washer and dryer in the hallway. On the lower level, a tiled entertainment room has French doors leading to a partially covered patio with a built-in barbeque adjacent to the pool. There is also a full bathroom and utility room. The patio has golden Jerusalem stone for low retaining walls, steps and slabs. The patio steps up to the slightly raised 20’ x 40’ gunite saltwater infinity pool. ​ This residence is just two blocks from all the shops and restaurants on Main Street but enjoys its peaceful neighborhood.